As the warrior's waited with shield and sword, the Lion King was ready as he roared. Marching into battle at a steady stride, protecting Ireland with great pride. After all was done, the battle of Clontarf was won, by King Brian, known as the lion. He lay his life down for a great cause, for us his sons, will never hear the lion's roars. As the Lion King held his head up high, he saw the three lions ruling the sky. swing, the heads rolled at the hand of the king. 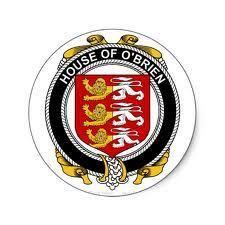 in the sky shall soar for i am O'Brien, hear me roar. A cherished symbol of The blessings of the hearth and home The Irish dearly love. In a world that changes, it's amazing how one person can make an Impact on you stopping you in your tracts. And as the world leaves you behind, you wonder how one single person can Impact you, leaving you speechless and teaching you a sense you never thought possible. The sense I talk of is love, how can you defy love? it having no definition. Love is a person, a moment, a place and a indescribable feeling. I wish someone would have warned me of it's excitements and dangers. Before I fell into it's vice like grip. But I guess love is everywhere and until you experience it you never really respect it. I've learnt my lesson and so will many other unfortunate souls, I guess the point is clear you can't avoid it so embrace it, but be aware of it's abilities as life unfolds. Ironic really, because just as I think I understand it everything changes, again and again. Oh, where, Kincora! is Brian the Great? And where is the beauty that once was thine? At the feast in thy halls,and drank the red wine? Oh, where, Kincora! are thy valorous lords? Oh, whither, thou Hospital! are they gone? Oh, where are the Dalcassians of the Golden Swords ? And where are the warriors Brian led on? The defeater of a hundred, the daringly brave Who set but slight store by jewels and rings. Who set but slight store by jewels and rings. Who swam down the torrent and laughed at it's wave? The ne'er vanquished sons of Erin the Brave, The great King of Onaght, renowned for it's worth, And the hosts of Baskinn, from the western wave, Where, Oh, Kincora?